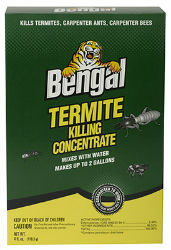 Kills swarming termites, carpenter ants, & carpenter bees. For outdoor use & outdoor perimeter treatment. 4 oz. concentrate mixes with water to make 2 gallons of insecticide.